The E280 Expansion Joint is normally used on fibreglass flat roofs which are 50 square metres and over. 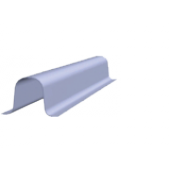 It can also be used to create rolls on any ridge details. It is compatible with C5 preformed closures. Used to simulate the appearance of raised rolled lead joints, also provides expansion. Expansion joints / trims on a Fibreglass or GRP Roof are generally required every 100 square metres.